The color will have transferred onto the art surface and a beautiful piece of artwork will emerge! 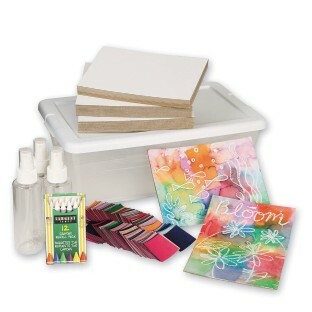 Our exclusive Tissue Paper Painting Easy Pack makes it so convenient for your group to create with this innovative painting technique! 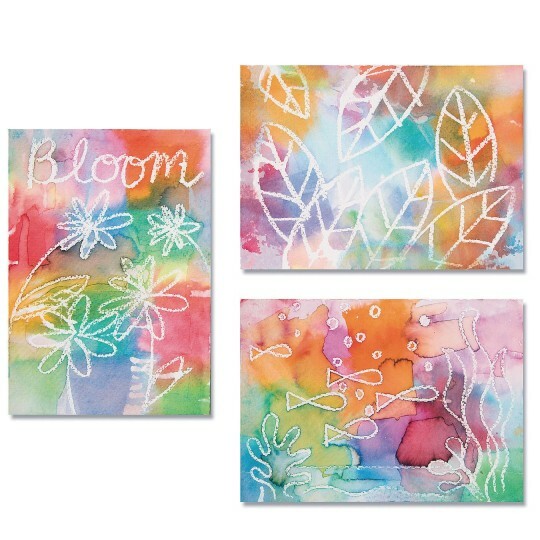 It’s easy for anyone to create beautiful watercolor-looking art using our pre-cut bleeding tissue squares. Simply pre-wet the watercolor panel then apply the paper squares randomly or in a planned arrangement. If desired, you can brush or spritz more water over the paper so that it accelerates the color “bleeding”. Pieces can be removed while still wet or after drying. The color will have transferred onto the art surface and a beautiful piece of artwork will emerge! We’ve included white crayons for creating “resist” designs, patterns, or words on the paper prior to adding the colored squares for more fun! Dye from the paper will stain hands and surfaces so protective care should be taken. Includes enough supplies to make at least 36 pieces of art: 36 – 5” x 7” watercolor paper panels, pack of 2500 - 1-1/2” bleeding art tissue squares in 25 assorted colors, 3 spray bottles, white crayons for creating resist patterns, and an idea guide all packed in a portable storage box.